A new page in China’s science fiction film industry has been turned, thanks to actor Wu Jing and others who believed in the film. 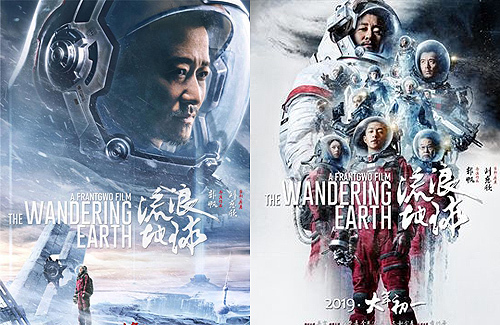 Set to open in Chinese box offices on Lunar New Year Day, The Wandering Earth <流浪地球> took four years to shoot and encountered countless challenges before it was ready for release. Production’s inexperience and the novelty of the subject matter led to many difficulties, but thanks to the help of Chinese actor Wu Jing (吴京), the movie finally saw the light of day. On tenterhooks for the four years when the movie was being made, director Frant Gwo (郭帆) called making the movie “a marathon with no end in sight”, and claimed to have slept only four hours a day during this period. Due to multiple challenges during the filming process, including financial woes faced by the production team, the science fiction movie was almost placed on hiatus. Luckily, Chinese actor Wu Jing (吴京) came to know about the matter and rendered his timely assistance, helping to bring the film’s vision to fruition. In 2018, the actor had read the script while in recovery from his leg injuries. He then said, “Let me take over this for you.” Not only did he not ask for his fees, the actor even invested millions into the production. Frant said gratefully, “Without Wu Jing, there would be no Wandering Earth; he came to our help at the most difficult hour. Seeing our entire preparation and filming process reminded him of the time he was working on Wolf Warrrior 2 <战狼>. “ The director added humbly that he felt that Wu Jing’s help was not because he saw the team’s immense potential, but more because he had the conviction that China would have its own science fiction film one day. As its title implies, the film revolves around a future where the sun starts expanding into a destructive star that will ruin other planets in the solar system, therefore forcing mankind to kick-start a “wandering Earth plan”, and employ numerous planetary engines in an attempt to “withdraw” earth from the solar system and search for a new home. The apocalyptic premise will see humans entering a prolonged, terrifying state of mass exodus. Making major amendments from the novel, the team added in the storyline of a father-son pair who resolves a long-held tension between them after many years, and enhanced the film with many visual effects, depicting an apocalyptic, ice-clad Shanghai and a rescue station in space. Taking four years to shoot, filming involved the drawing of 3000 layout blueprints, 8000 storyboard drafts, building of 10,000 pieces of props and a 100,000-square-meters filming set, and the use of 2500 special effects lens. However, the biggest challenge during filming was actually doubt from various parties. As such, director Kwok hopes that society can give greater leeway to the budding Chinese sci-fi film-making industry, as greater innovations can only develop if someone is first allowed to think out of the box. Having undergone a few rounds of test screening, audiences have responded favorably. Many have equated the film’s premiere as a symbolic first chapter for China’s science fiction film market, and it will be award-winning Chinese science fiction author Liu Cixin’s (刘慈欣) first novel-to-screen adaptation. Also the film’s producer, Liu Cixin said, “Chinese science fiction has officially begun today. The film will showcase a greater depth than the novel was able to, and will tell the story of an oriental attachment to family, land and showcase the fabric of human relations via the medium of outer space.” Afterward, he further affirmed the film on his personal Weibo, saying that it has reached excellence even by American sci-fi movie standards. wow what an interesting premise! instead of leaving the planet, we leave WITH the planet. really flips this on its head + requires some out of the box thinking. this sounds like something i would wanna watch. Very interesting plot indeed. I can’t wait till I check this out. Wu Jing gives back to Chinese movies. Good on him.